The perfect solution for uneven ground! Noble Contour Fencing is the ideal pasture or perimeter fence. It is horse safe, extremely durable and requires zero maintenance. Contour Fencing is as attractive as it is strong, offering lasting beauty through decades of use. The Contour Fence is a permanent post and rail system that is designed to flow up and down with the contour of the ground and maintain a smooth top line. It is constructed out of American-made 1 5/8", 15 gauge round galvanized steel tubing. The height and rail spacing is designed to match all 3, 4, 5, and 6 rail Noble Panels or Gates. 3 and 4 rail configurations have 12 1/2" spacing between rails. 5 and 6 rail configurations have 8 1/2" spacing between rails. Custom height and rail spacing is available on special order (a minimum of 500' required). Noble Contour Fencing is easy to install. Fence posts are available in either 7' or 8' lengths depending upon the height of fence. When installed, the posts will be set in concrete on 8' centers. The 24' long fence rails are made to slide through the posts. They include a 3" long reduction swage on one end for joining rails together. The joint where the rails connect does not have to reside at a post. This joint can be anywhere in the fenceline. After the rails are in position, self tapping screws (supplied) are used to lock each rail to each post. Corners are easy to make. Simply add our "L" fittings where you want to change direction. 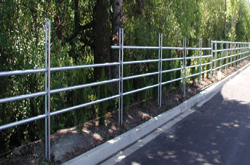 We also offer a "T" fitting that will allow you to connect a section of cross fencing anywhere on the fenceline. The fitting just slides over the rail wherever you want to start your section of cross fencing. All of these fittings can be custom made at any degree to accomodate your special needs. Noble Gates are used in the fence line and are set between heavy wall round gate posts. The gate posts have rail-receiving brackets that adjust to any degree to meet the rails. Gates will hinge from standard threaded hanger bolts or heavy duty weld-on hinge pins that slide through holes milled in the posts. Post sizes range from 2 3/8" to 2 7/8" to 4" in diameter, depending on gate size and weight.